24 August 2015 – Official Rugby World Cup 2015 Tournament Provider, Duracell, today launches a new objective measure of power and endurance to help fans to understand more about teams, players and key moments at the 2015 Rugby World Cup. Called the Duracell #POWERCHECK™, the unique measurement will share insight around the power and endurance that have proved vital ingredients for previous winners of the famous Webb Ellis Cup and that epitomise the Duracell brand. Working with Official Rugby World Cup data providers, Opta, the Duracell #POWERCHECK™ will track a combination of performance indicators including tackles, carries, turnovers won and discipline during the course of each game, with a greater weighting towards players that remain on the pitch for longer. Just like the power check on a Duracell battery, this data will be then be used to create a score out of 100. The whole process rewards the performances of players who stay stronger for longer. “When we first thought of the Duracell brand alongside rugby, the link with power was an obvious one. However, Duracell doesn’t provide one burst of strength, it does so over a longer period than anyone else – out-powering and out-lasting the competition. That combination of power and endurance is crucial in rugby too, and the Duracell #POWERCHECK™ celebrates that.” explained Vicky Miller, Duracell Business Leader, UK & Ireland. In order to help bring the Duracell #POWERCHECK™ Rugby World Cup 2015 activity to life, the brand has signed up Wales and British Lions captain Sam Warburton. Widely respected as one of the best open-side flankers in the game, Sam’s all action and powerful style of play epitomises Duracell’s campaign. The Duracell #POWERCHECK™ also ranked him as one of the leading players during the 2011 Rugby World Cup in New Zealand where he helped his country to reach the semi-final for the first time in 24 years. Duracell is an Official Tournament Provider for Rugby World Cup 2015, which kicks off in England on September 18 later this year. The Duracell #POWERCHECK™ will be trialled at the World Cup warm-up matches in the build-up to the tournament. The deal includes use of Rugby World Cup 2015 marks, use of past and present Rugby World Cup footage and tickets to matches including the Rugby World Cup 2015 Final. Duracell will also provide a range of its batteries to support the tournament’s delivery from 18 September to 31 October, 2015. Duracell is the world’s leading manufacturer and marketer of high performance alkaline batteries. As the leader in the personal power category, Duracell has a rich history of innovation continuously introducing batteries that are more compact, more powerful and longer lasting than competitor brands. 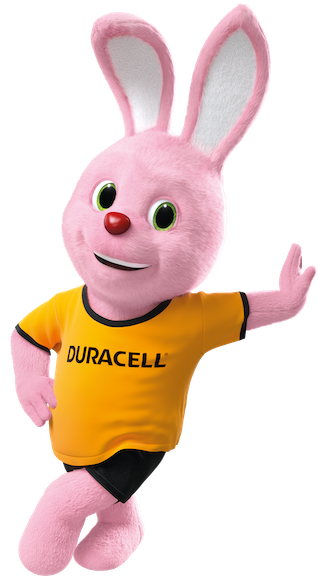 Since 1973, the Duracell Bunny has been at the heart of the brand demonstrating Duracell’s longer lasting power. Today Bunny is one of the most recognised brand icons in the world. In addition to its alkaline batteries, the company sells primary lithium, zinc air, and rechargeable nickel-metal hydride batteries as well as a line of flashlights. About Rugby World Cup: Rugby World Cup is the financial engine behind unprecedented investment and growth in rugby worldwide. The net Rugby World Cup surplus from the commercial success of France 2007 and New Zealand 2011 has enabled World Rugby to invest more than £150 million in the game between 2009 and 2012 and commit an anticipated injection of more than £180 million between 2013 and 2016 to underwrite a large range of major funding initiatives including annual national union grants and strategic investments focusing on growing participation and increasing competition across all 120 national member unions affiliated to World Rugby.